Tom Skilling has put out an early roundup of this winter’s weather. Not surprisingly, it’s been colder than average (even though December and January had above-average temperatures) and cloudier than average (probably the 4th cloudiest) and snowier than average (probably in the top 10%, although spring is part of our snow season). I suppose I should be glad that we’re definitely not in a drought, but mostly I just want to see some green and not wear 3 layers of clothing. 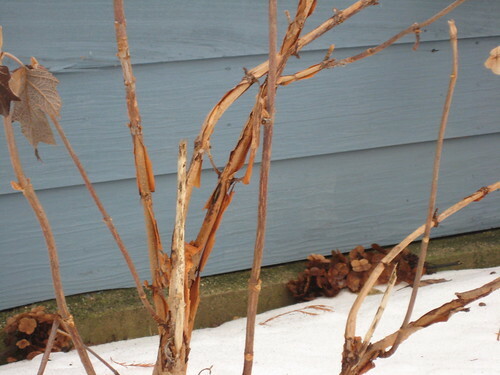 In fall, I was planning to do all sorts of pictures of plants that had “winter interest”, like the exfoliating bark of an oakleaf hydrangea. This winter has been a bit too hard (and way too cloudy) for me to actually do this until now. I suppose I could also snap a picture of the cheery red-stemmed varigated dogwood, but I’d really prefer to take pictures of daffodils coming up. We’ll see if my wishes will be granted, or if I’ll be reduced to looking for patterns in the copious amounts of squirrel poop in the icy backyard. The pond mostly thawed out with the inch of rain and temperatures in the 40s that we had yesterday. 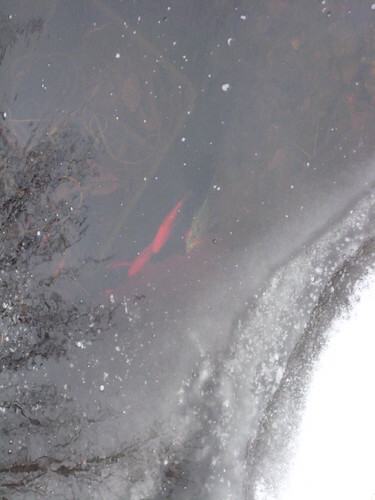 The goldfish did some leisurely circuits, but were pretty shy about my looming over the pond to take their picture. There were still a couple of inches of snow on the ground, so I can’t go looking for snowdrops. I did find ample evidence in the backyard that There Are Squirrels and that they are eating well. And now we head back into the freezer until the end of the week. I should probably start thinking about buying seeds for the spring, but the whole green and growing thing seems so implausible right now. Perhaps in March…. Yes, I did post before about not needing the pond de-icer (the red donut to the left) by late January, but this year is proving me wrong. I would have never thought that the entire pond would be frozen over and snow-covered in mid-February with more single-digit readings predicted. Fortunately, today is one of the two sunny days we’ve had so far this February, so it’s considerably less dreary than usual. According to my fearless Chicago weather chart, the record and average lows only really start warming up the last week of February. I will comfort myself with the thought that I will probably see the fish in March, and the unending procession of snowfalls (and subsequent shoveling) will have to end sometime. Last year, there was snow in April, though, so I won’t be putting away the snow shovel any day soon. 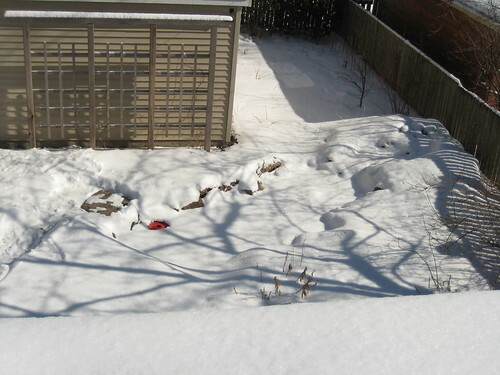 The Sun-Times garden blog has disappeared, so it looks like neither Chicago paper has a gardening blog any more. It’s been cloudy and snowy for what seems like forever. The latest snow started off as sleet, so I can’t even take a stroll around the neighborhood to see if any snowdrops are coming up. Spring can’t come soon enough….